Peel, de-seed and chop the pumpkin into chunks and scatter the chunks of flesh in a large roasting dish or baking tray. Drizzle with a little oil and season with salt and pepper. Roast in the oven for 45 minutes, or until the pumpkin is soft and has taken on a little caramelized colour. Meanwhile, heat 1 tablespoon olive oil in a large saucepan over a low heat and fry the onions for about 8 minutes, or until soft. Add the garlic and cook for a further minute, then add the allspice and cayenne and stir well. Add the roasted pumpkin, followed by the stock, sweet chilli sauce and vinegar. Bring to the boil, then turn the heat down to low and simmer for 30 minutes. Once the pumpkin is cooked, turn the oven down to 150°C/300°F/Gas 2. Scatter the bread onto a baking sheet, drizzle with a little olive oil and season with salt and pepper. Bake for 30 minutes, or until the croûtons are dried out and very crisp. Remove from the oven andleave to cool. 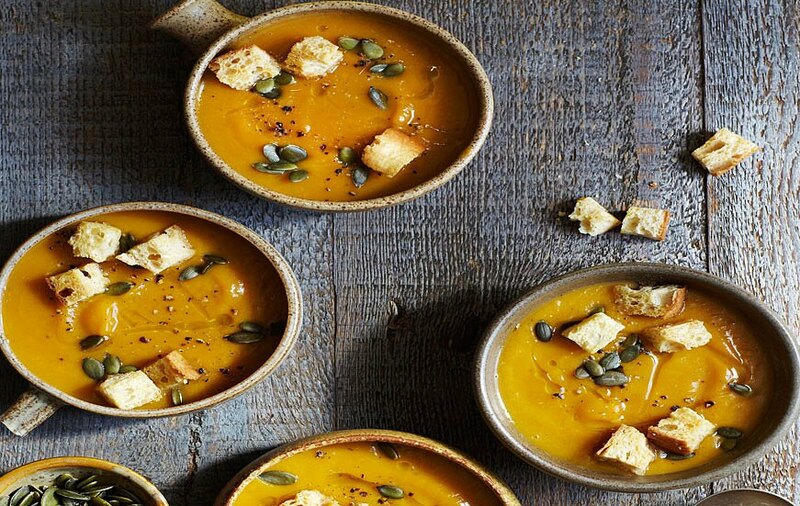 Using a hand-held blender, carefully pulse the pumpkin soup until it is completely smooth. Taste and adjust the seasoning, if necessary, with more salt and pepper. Serve in individual bowls with a drizzle of olive oil, a scattering of pumpkin seeds and the spelt croûtons.